Such a fun cat to make. He is a character from the movie Coraline. 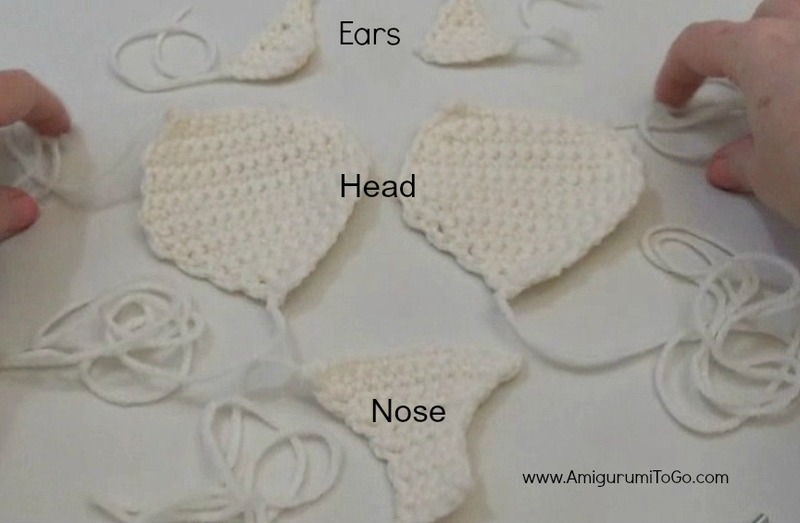 1) chain 7 * begin with a long starting yarn tail that you will use to sew the ear to the head. finish off making sure to pull the finishing knot very tight. Cut the yarn tail down leaving a short length. Fray the ends to give it a ratty sorta look. I show how to sew this part a bit differently in the video tutorial then I explain here and I think the way I do it in the video is better but it's too hard to explain that in written form so here is the best way I can explain it. Lay the nose over one of the head pieces, it will not fit length ways but the top part will fit end to end across the top of the head. Sew across the top starting at one end and work toward the center, leave an opening for stuffing, now start at the other end and towards the center. You want to stuff from the top downwards as you did for the head so leave an opening. Once the top is sewn in place start sewing around the nose pulling the nose downwards a bit (not too much) and make sure you keep the nose centered as you pull and sew. Stuff and shape and then close up that opening at the top. Whip stitch a nose in before sewing the 2 head pieces together. Now you can sew the 2 head pieces together. Starting from the mouth area and work up. Leaving an opening on the top of the head for stuffing. You want to stuff from the top down towards the mouth. Close up once you have the stuffing in and the shape you want. Take a look at pictures of the cat to stuff and shape accordingly or view the video tutorial for this part if it's confusing. *It's best to put these in after the cat is fully assembled. Cut eyes from felt. The shape is very important to get that creepy look. You can cut eyelids from black felt or outline the eye with yarn. I show how to do both these methods at the end of the video tutorial. If you use felt, carefully glue all the pieces together. You can glue the eye on first then add in the other pieces if that's easier too. From trying different things I found that waxed dental floss makes the best whiskers. Cut about 2 feet, fold in half then fold in half again. 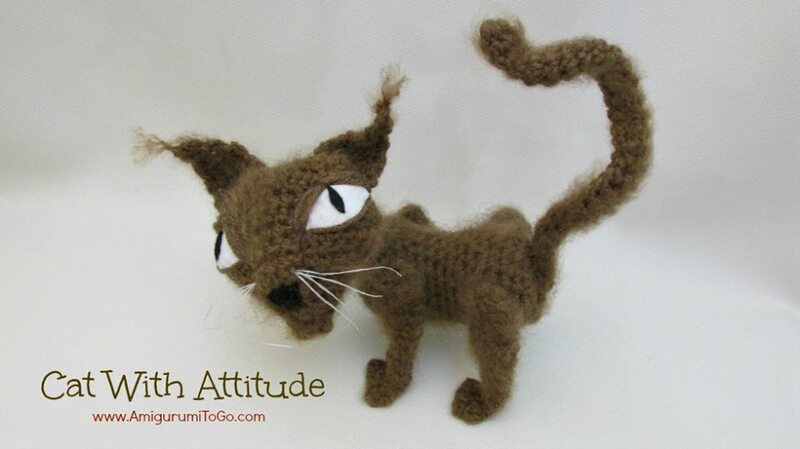 Thread through a yarn needle and pull through the head where you want the whiskers to be. Repeat these steps for the other side. Bring both the floss ends you won't be using as whiskers out through a stitch in the head, knot them off and hide the knot inside the head. Cut the exposed ends to desired length, you should now have 4 whiskers on each side. View the video if this part is confusing. * Stuff the body now. The head of the cat will be away from the body which makes it top heavy so to keep the cat from flopping over when you stand it up, I recommend stuffing the back end of the body with rice or some pebbles. I used pebbles and made sure they were large enough that none would work through the stitches of the body. If you use rice then put the rice inside a nylon stocking and knot the stocking off. Fold 4 or 5 pipe cleaners in half and twist the one end to make a loop then push that loop into the body until it won't go in anymore. Cut the exposed ends, fold over and push into the neck. Whip stitch the neck to the body. One pipe cleaner per leg. Fold the pipe cleaner in half as pictured and push the bend into the leg until it reaches the top of the leg. Twist the two exposed pipe ends to make them one piece then follow the shape of the foot pad. Cut the excess off then whip stitch the foot pad and pipe cleaner together. Hide the yarn tail inside the leg. Shape the body a bit more with your fingers. Work that stuffing around in there until you are happy with the shape. Pin the legs on as pictured and sew on. Whip stitch them to make the legs as pictured. 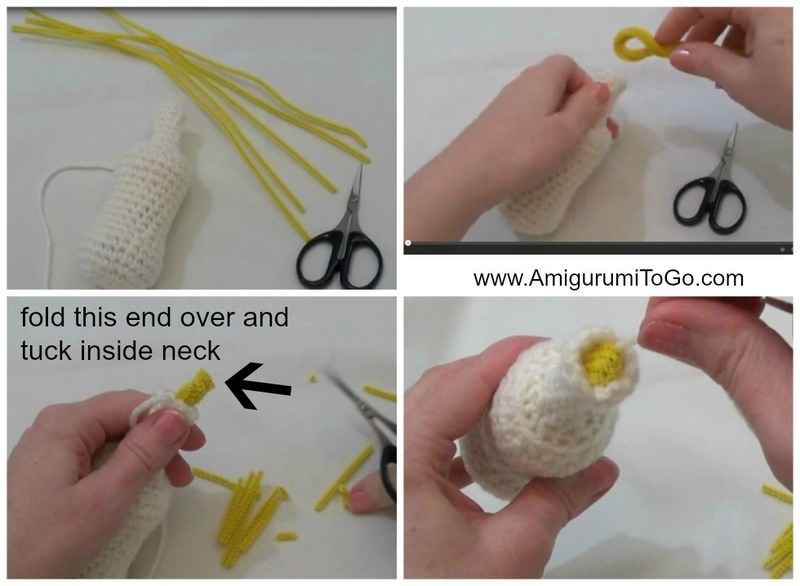 Twist 2 or 3 pipe cleaners together, fold down the tips on one end and then push the folded ends into the tail, all the way to the tip, it might have difficulty reaching the tip so view the video on how to get it to the end. Now fold the other ends of the pipe cleaners and tuck inside the tail. Now you can sew to the back of the body as pictured. 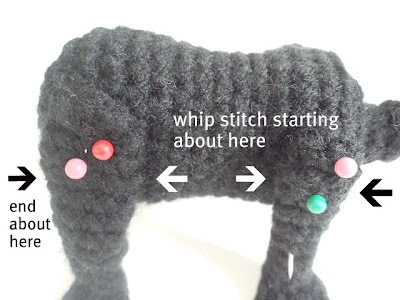 Tack the tail to the body with a couple of stitches to hold it in an upright position. And that's it, you made yourself a cat! 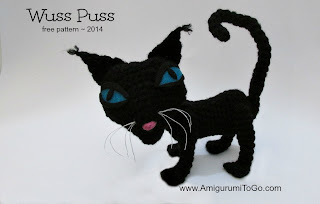 If you made Wuss Puss or one of his friends please post pictures on my facebook page Amigurumi Freely I'd love to see! Thank you for the pattern. He'll be a great companion for my Coraline doll. Thank you! Wuss Puss is so sweet. Hope she fits in with my other crocheted pets. Thank you so much for this pattern it is fantastic, I can't wait to give it a try, you are so very talented. Oh this is awesome..How did I miss it..Found it on Oombawka Designs and so glad I did..It is for sure going on my to-do list. <3 You do such awesome work. omgosh i love this pattern you are a amazing kind caring and wonderful person to share so many cute patterns for free. As a american on a fixed income i appreciate the kindness you have shown me and everyone else with the free patterns ty again for sharing you my friend RAWK!!!!!!!!!!!! I'm so glad you will enjoy the patterns and find them helpful too. It's so great to hear that!!! Hello ! I really love what you do, your patterns.. And this time I made the cat from Caroline ! I love it ! Thanks ! love you kitty, I had two black cats about 2 1/2 years ago. .there no longer with me. Thanks for the pattern, can't wait to make one!!!!!!!!! holy crap this is awesome! Thank you for this rad pattern! !